Studio Ghibli has a new film set to hit theaters in Japan later this summer, and the first trailer has been released. 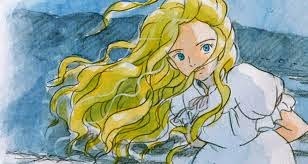 The film is WHEN MARNIE WAS THERE, based on the book by Joan G. Robinson. It tells the story of a lonely girl who finds solice and companionship in an unusual friend - a freind who happens to be a ghost. Much like the trailer for THE WIND RISES, this one also shows a series of clips set to music, but doesn't do much in the way of revealing plot details. The overall tone of the footage is decidedly wistful, as we see a lonely girl find comfort in a friend. The film is being directed by Yonebayashi Hiromasa (THE SECRET WORLD OF ARRIETY), from a script written by Niwa Keiko (FROM UP ON POPPY HILL). It is set to open in Japan in July, and we don't have word on a U.S. release date at this point.